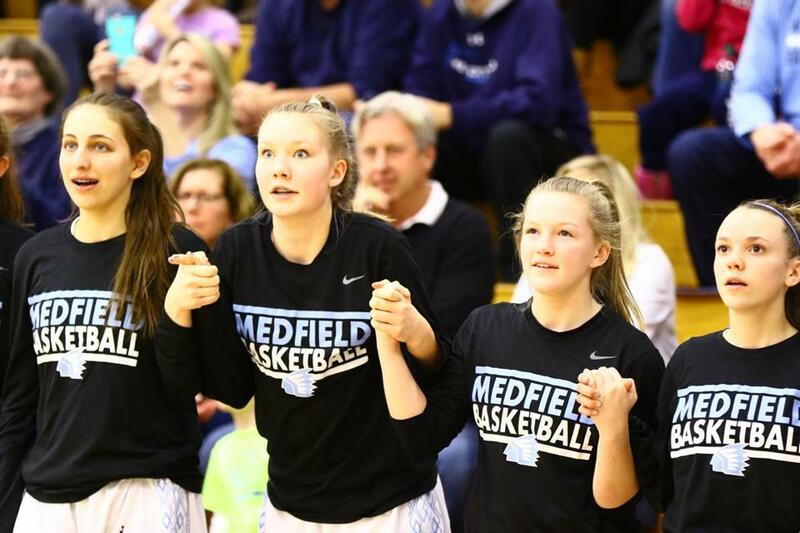 Medfield High players watch in anticipation as teammate Maggie McCarthy shoots for her 1,000th career point during the fourth quarter of Saturday’s Division 2 state final at Blake Arena in Springfield. 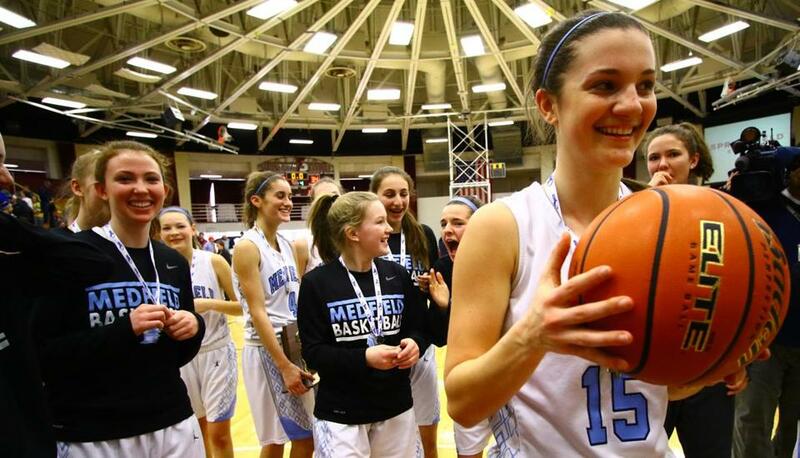 SPRINGFIELD — As if Saturday couldn’t get any sweeter for Medfield girls’ basketball star Maggie McCarthy. On her 17th birthday, with 56 seconds to play, her Warriors team was in full control of Arlington Catholic, on the verge of its first state title since 2013. And then the junior stepped up to the line and knocked down a free throw to become the eighth 1,000-point scorer in school history as Medfield rolled to a 47-34 win and the Division 2 title at Springfield College. McCarthy had just 2 points in the first half, but went on to lead the team with 12, to go along with 8 rebounds, 6 steals, 3 assists, and 2 blocks. In a thoughtful gesture from the Arlington Catholic side, it was actually an intentional foul inside the final minute of regulation that sent McCarthy to the line. Brady said he could see McCarthy pressing and making every effort to reach the milestone in the game’s final minutes. “To be frank, if my kid was in that situation, you know, I’d love to see them get their 1,000th,” Brady said. “At that point it seemed just right to complete the day. Just 10 days earlier, in the Central sectional quarterfinals, senior forward Lauren Casieri surpassed the 1,000-point plateau as well. For Arlington Catholic (19-7), it was one comeback the Cougars just couldn’t complete. Against Foxborough in the state semifinals, the Cougars bounced back from a scoreless third quarter to take a 37-30 win behind an 18-point fourth quarter. This time around, it was the second quarter that plagued Arlington Catholic, which scored just one field goal in the eight-minute period. The Cougars managed to cut the deficit to 8 points after starting the second half with two free throws from senior center Lena Perez (5 points, eight rebounds). But that was as close as they would get. The Warriors (23-2) pulled away for good in the third quarter after getting hot all the way down the bench. Senior guard Sophia Ouimette had 7 points in the third quarter alone (11 for the game), and classmate Allison Petit knocked down her first points of the game on a three with 3:54 to play, pushing the Medfield lead to 31-17. The Warriors also did well to deny Arlington Catholic sophomore guard Erin Donlan, who still managed a game-high 14 points despite being faceguarded for much of the game by Petit. The Warriors got big contributions in the first half from Casieri (9 points, 4 rebounds, 2 blocks) and junior guard Emma Anderson (8 points). Medfield reclaimed the state title after falling to Duxbury, 51-42, in the 2015 final. Maggie McCarthy received the winning game ball after she scored her 1,000th point during Medfield’s victory in the Division 2 state championship game Saturday at Springfield College. MEDFIELD (23-2) — Maggie McCarthy 3 4 12, Allie Petit 2 0 5, Lauren Casieri 4 1 9, Megan Zona 1 0 2, Emma Anderson 3 0 8, Sophie Ouimette 4 2 11. Totals 17 7 47. ARLINGTON CATHOLIC (19-7) — Erin Donlan 6 0 14, Alexandra Ball 0 2 2, Julia Mattera 1 0 2, Monica Royo 4 0 8, Lena Perez 1 3 5, Anastasia Maniatis 1 0 3. Totals 13 5 34. Halftime: Medfield, 23-13. 3-pt. goals: Maggie McCarthy 2, Allie Petit, Emma Anderson 2, Sophie Ouimette; Erin Donlan 2, Anastasia Maniatis. Alex Schroeder can be reached at alex.schroeder@globe.com.